Well, here we are again, another Monday, and Cactus Rose remains up on the wall. There has been progress, though. Pinned up here beside her on the wall are all of the base curve pieces I need for the rest of the borders, and half of the arcs I need, all finished and de-papered. There are more of the arcs in various stages of being finished. I still need to do the top parts. Getting this far was my goal for March, documented and posted as # 87 in the goals linky party on the Lovely Year of finishes. The other thing up on the wall is a McKenna Ryan quilt, called In Full Bloom. I put it up there last week in the middle of a snow storm in the effort to make the place look more like spring. I also needed to get some fabric for the borders, so I wanted to study it for a while. The borders are purchased, and I also managed to spend a bit of time with my fabrics and tiny scissors, and finished the middle block with the bunny. So, this one is all ready to sew together and get the borders on. I'm not going to put a time on this one. I want to concentrate on getting poor old Cactus Rose finished first. I think she's waited long enough. And, although she may be gorgeous, I must confess that I'm getting awfully tired of looking at her. But I will persevere and get her done. I'm linking up to Judy's Design Wall Monday and also to the Finishes party for the Lovely Year of finishes. and piecing is getting low. And then yesterday, I had the great pleasure of going on a road trip with a great group of ladies. Karen, Christine, Gail and I headed off for a day of quilt shop hopping and lunching and having tea and desserts. And along the way, there was also a stop to see some model trains. Gail's husband is a member of a model train club. Well, let me tell you, our fabric stashes have nothing on these men. It was held in one of those steel buildings that are found on some farms. The number of trains and cars and assorted accessories to go with it was astounding. Gail wrote a post about our day trip here, including some pictures of the trains. She was in charge of documenting the day, complete with photographic evidence. Balance: 5.7 more yards out than in. Not bad, I'm still in the black. But I'd better get busy and get something done this week, because there are five more yards of really fun Thomas the Tank Engine fabrics coming from the Fat Quarter Shop for birthday gifts for our grandson Avery. Thomas is his favourite toy, so I'm going to make him some pillow cases and some pajamas. I'm linking up with Judy's Stash Report. And then it just might be time to clean up this mess in my sewing area. I can't get near my sewing machine, or my cutting table. Maybe if I put on some music, and assign myself to work at it for the length of an album, I can get some of it tidied away. It has rather gotten to the point where I don't even know where to begin. Maybe some Michael Card will help to sooth this savage beast of a mess. I found this very old, probably eight years old, UFO in a drawer this afternoon. So it is spring in my studio. Even though it is still winter outside. I still have Cactus Rose on the wall. It is slowly growing. 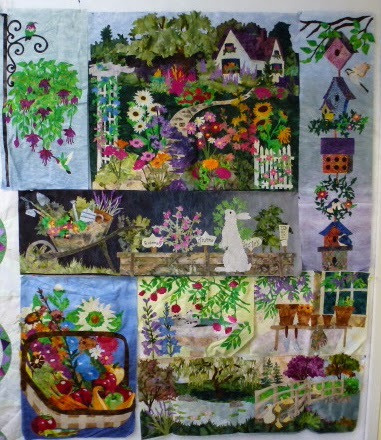 I have one more section to put together for the top border, and then it can go on to the quilt. I've been slowly working on paper piecing the parts required for the last of these 2 borders, and then it will be done. I was going to put it away, and work on something else for a while, as I'm getting rather tired of looking at this. But I've since changed my mind. I'm going to keep at it until it is done. I don't want to take the chance that it will get packed away and then left to age some more. It's old enough, and ready to be done. On Another note, my challenge piece for the "A Road Runs Through It... " is done, and ready to be quilted. I'm so pleased with it! And so pleased with myself that I got it done. I have spent all day today working on a challenge piece for the guild. The theme for the challenge is "A Road Runs Through It...." I can't show any pictures of it, because it's a secret, but I've had so much fun working on it today! I can count the fabric for it next week, but that's as public as I can go, until after the May meeting. However, it's getting late, and my eyes are going rather buggy, so it's time to quit for the day. Apart from this, the only quilting behaviour going on here on my own quilts that has used any stash, has been sewing hanging sleeves onto the backs of quilts for a quilt show in Sheddon in the middle of April, and my 2 aqua rainbow challenge blocks yesterday. These numbers could be changing this coming week. I've heard talk of a road trip to some fabric shops next Saturday. I have border to pick up for one of the quilts on my UFO list. Whether I'll bee disciplined enough to only pick up that border fabric, and nothing else, remains to be seen. I just finished the 2 pinwheel blocks I've been doing monthly for the SoScrappy Rainbow Saturday. I wanted to get both of them done today, because there is a chance I'll be going on a road trip next Saturday. Said road trip just might involve some friends and some fabric and yarn purchases, so I wanted to get them done today. I've had a few distractions today, though, the main one being DD and the garment sewing I've been doing for her. I remember now why I make quilts. The fitting of the skirt wasn't right, of course, so I had to rip out, and alter and then sew back together. It now fits, but it needs a lining. I think it's going to wait for a while now. In between working on the skirt, I've been sewing these pinwheels, which are a whole lot more entertaining. As usual, for these blocks, I've done the pinwheels in the monthly colour, and the frames in the colour directly opposite on the colour wheel, in this case a kinda redish/orange/pink. And now, I have hanging sleeves to do. Here she is, in all her glory. It was a gorgeous day out today, so I took the opportunity to recruit husband and son for some help photographing this wonderful quilt. It is Thanksgiving, by Judy Martin, in her book Patchwork Among Friends. I Quilted it with a fern leaf type free hand design in all the open areas, and continuous curves in the leaf blocks. This quilt was a joy to piece, with the instructions clear, and the piecing easy, although there was an awful lot of it. But so very very worth it. Here's a closer look at the bottom corner. This quilt has been just over a year in the making. It finished up at 98x98 inches square. It has my usual striped faux piped binding. I love this quilt!! I'm linking up to TGIFF and Link a Finish Friday, just because I'm so excited about this quilt that I have to share it. My UFO for March is this Cactus Rose, a design by Judy Neimeyer. My goal for this month was to get another of the curved pieced borders done, To date, I have all of the units for this border paper pieced, and all the paper removed. 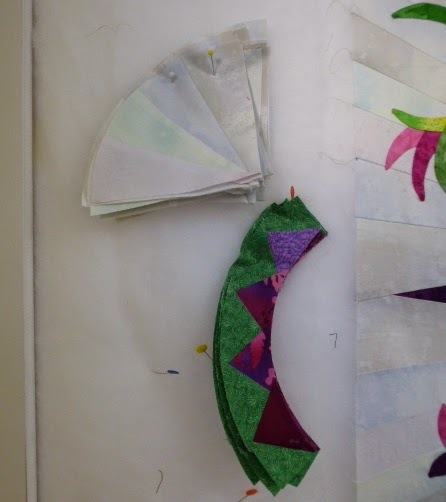 A couple of the triangular sections are sewn together. I've moved all the components up to the long arm studio. This way, when I need to sit down to rest my feet and legs, I can sew one or two of them together. It might have a better chance of getting more of it done keeping it up there. It should be possible to get this border done, and on by the end of the month. If I can get some of the units for the next side paper pieced before the end of the month, I'll call that a bonus. I'm linking up to The Needle and Thread Network Work in progress Wednesday. I'm still trying to get caught up with documenting quilts that I have done for clients. I'm about a month behind, now, with it. This past January I received a very special, and exciting request from Kathy, asking if I would quilt her Civil War quilt. This was the first time that I had received a request for quilting from someone who knew me only through my blog, which made it even more exciting. We arranged a time for her to come and deliver it, and it was so lovely to meet her. We'd talked often through comments on each other blogs, but had never met face to face. So, this is her quilt, done in lovely civil war, Barbara Brackman reproduction fabrics. They are seriously soft and smooth and oh so petable. When we were discussing what kind of design she would like, I recommended that she take a browse through the designs at Digitech Designs and she decided on this pantograph called Angel Wings. At first glance on the quilt, all that is visible are the gentle curves. But on closer inspection, the angels are visible. I love the subtlety of it. This is the back of the quilt. She put almost as much time and thought into the back, as the front. She said she collected most of the prints from the States, I believe. There are pictures of the various presidents of the times, the flags of the States, and even a copy of the Declaration of Independence. It was such a wonderful experience to be able to work on this quilt. Kathy blogged about finishing it here. 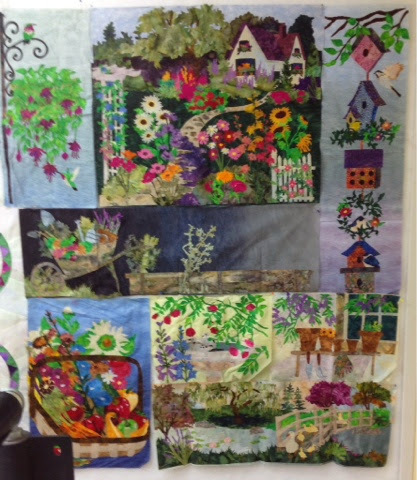 Thanks, Kathy, for the opportunity to do this quilt. I hope we get to work together again in the future. I still don't have anything new on my wall. I've been working on getting Thanksgiving, a pattern from Judy Martin, finished. I took the last stitches in the hanging sleeve tonight. It is officially done! Now all I need is some decent weather so I can get outside to take a picture of this massive thing. In the meantime, here's a pic of the corner of it, and the binding. I used a striped fabric out of my collection, paired with one of the ugliest fabrics I had in my stash. It was a green background, with huge orange tulips and huge bunches of grapes. But, once it was sewn into the binding, with only the edge showing as the piping, there is no evidence at all that it was one of the ugliest fabrics, ever. Why did I originally buy it? I had plans on making a quilt that needed appliqued bunches of grapes. Rather than applique each individual circle for each grape, I was going to do a broiderie perse version, and cut the bunch of grapes out of this fabric, and applique it down. However, the project never got any further than inside my head. I'm linking up my non-design wall to Judy's Design Wall Monday. Today, I'm working on finishing the blouse for Becca I started yesterday. it's all finished, except for the hemming. I've always disliked hemming by hand, although it really has no difference than stitching applique down by hand. But today, I'm trying to change my attitude to hand hemming, and look at it as the same as any other slow hand stitching, a time to sit back and enjoy the process. And, I've found that it's working. It's giving me the time to think about the project, and to enjoy thinking about the person it is intended for, my lovely daughter. After this is done, we'll start working on the skirt we bought fabric for. Because of the clothing manufacture, quilting has taken a bit of a back seat, but I still had a bit of stash usage for the bowties I made this week. Balance: 12.8 more yards out than in. I made up my monthly bow ties yesterday, in the March colour of aqua. This is as close as we are going to get to the colour of open water for quite some time yet. When I got up this morning, it was snowing.....sigh. I'm linking up to SoScrappy Saturday. I've made progress on my Pinery sweater. I've divided the sleeves off, so the part that takes the longest, the yoke, is done. It's working up much faster this second time around, probably both from the larger needle size, and the first practice run through. I'm still enjoying this pattern and the softness of the wool, so it's a good thing. Not much else new around here. I've been busy working on quilts for clients, and with my own sewing. I'm currently working on bow tie blocks, in preparation for tomorrow's aqua blocks. The 3 inch ones are done, and after I link this up to Judy's On the Needles, I'm going to go back and start the six inch ones. I want to get these done, because it turns out I'm going to be doing some garment sewing for my daughter. She came downstairs a couple of days ago, armed with the Sears catalogue, and a big grin on her face, and asked me "guess what I'd like to have you make for me out of this?". Of course, my first thought was she was going to show me some maternity clothes she wanted. But no, that was a false alarm and wishful thinking on my part, she just had some things she saw that she liked and wondered if I could make them for less than the cost of them ready made. So, tomorrow, we're going to have some mother daughter bonding time, and go pattern and fabric shopping. Sounds like a good time to me, and I've always loved sewing for her. And now, back to my aqua fabrics, with pictures tomorrow. I've found the pattern for this quilt, and I've figured out where I was when I abandoned it years ago. Even more important, I've gotten some hand stitching done on it, and have figured out how to proceed from here. The centers are on the 2 small compasses, and I've done some of the red tear drop shapes onto the parts that have already been pieced together. So, from here, I'm going to piece together the corner sections of the quilt. Then, I'm going to piece together the long sashes that need to go between the long center section that is already done and the corner sections. I'll hand sew the long sashes to the center section, since I don't want the machine stitching to show on the back. Then, I can machine piece the corner sections to the long sashes. After that, I can machine piece more fabric to the backing, and get some batting into those sections. Once that is all done, I can load it onto the long arm to baste for the hand quilting. It's still going to take quite a while to get it done, but at least I have a plan of attack. It was the lack of that plan that had this sitting in its box for so long. My plan for today is to bet some of the green leaf shapes prepped and more of the red tear drops done. onto the sash sections. I missed last Sunday's Stash report, so this is for 2 weeks this time. I added some fabric that I simply couldn't resist. Two yards of this really fun fabric. I have no idea what I'll do with it, but it was impossible not to come home without it. Maybe I'll make some pillow cases for camping, or something like that. Balance: 12.45 more yards used than added. patches are done. The colours in this picture aren't quite accurate, the colours are a bit brighter in real life. But the sun was down, and I'm taking the picture by indoor light, so this is as good as it gets. I spent the afternoon over at Gail's and finished these there. 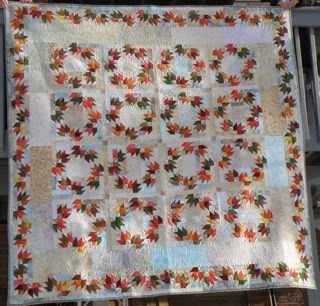 Then I got the binding for my Thanksgiving Leaves all sewn together. It needs its final iron, and then, after I make a hanging sleeve, I can get the binding onto it. Yeehaw!! Everyone but Scott and are are away from home this weekend, so I think I'm going to throw myself a quilt trimming party, using their dining room table, which is the biggest free standing surface in the house. There might be some wild jumping up and down and happy dancing done once this monster of a quilt is finished. In the meantime, I'm linking up to the Scraphappy Saturday. I'm almost finished this pair of socks. All I need to do is graft the toes and sew in the end at the cuff. And since these socks are more or less done, I cast on for my Pinery Sweater for try number 2. I have the right sized needles this time, and I also changed the neck by adding some ribbing. Hopefully this sweater will be ready to wear by the time the semi-warmer weather comes. It knits up faster with the larger sized needles. The neck still isn't sitting right, since it's still distorted by the cables, but I figure I can finish the edge of the neck with some crochet stitches to even it out. I'm linking up to Judy's On the Needles. I'm about halfway done my Thanksgiving Leaves quilt. Now that I am doing what it wanted, it's going much better. Another day like today should finish it. Here's another installment of my still very far behind, documentation of the quilts I've been doing for my customers. It's a good thing that I get the quilting done on them a lot faster than I get the writing about them done. These quilts all belong to Amalia. She is a very prolific piecer. The variety in the fabrics she's used from quilt to quilt is quite fun. I am really drawn to the colours in this first one. Something about just using variations of one colour, and in solids, is very graphic and appealing. I've never made anything even remotely like this, But because of doing work for others, I get to play with it, without having to make it. 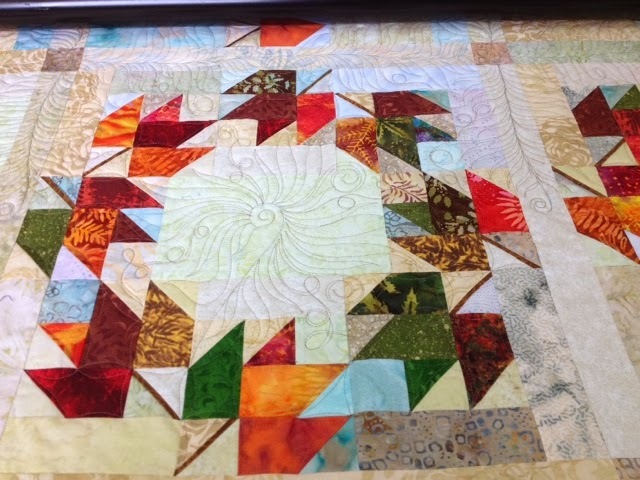 It is quilted using the Square Spiral pantograph by Keryn Emmerson. 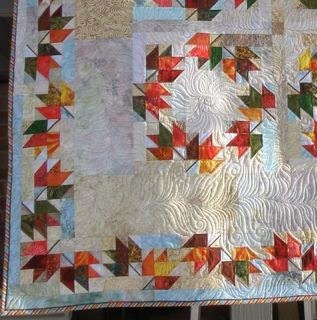 The strong diagonal of the quilting fits quite well with the strong horizontals and verticals of the piecing. This next one is made of a bunch of lovely florals, pieced in large sections, which gives the fabrics a wonderful opportunity to shine. The addition of the pieced hearts is so much fun. 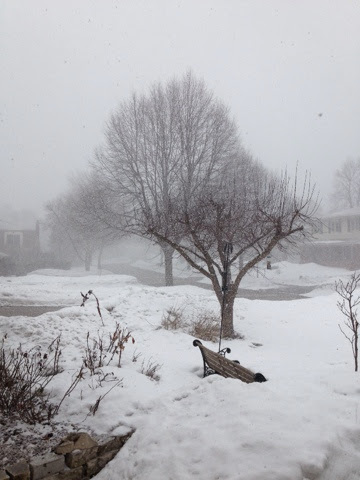 It was lovely to look at the floral fabrics as the snow kept piling up outside. I quilted it with a free hand floral. The hearts are outlined, and then echoed inside the hearts. Here's her spinning four patch. She made a wonderful fabric choice here. I really like the blues and greens against the black. I quilted a spiral feather inside inside each of the blocks, with the feathers extending out into the sashes. The spiraling of the feathers increases the motion that already exists in the blocks. These were so much fun to do. Here is Cactus Rose once more. She keeps showing up every now and then, and then disappears and retreats back into her box again. I'm hoping this time, to get it finished. I have designated this as March's assignment for the Lovely Year of Finishes Challenge. I'm going to say that I will get 2 more borders on this month. I'd like to think I'll get all three of the curved borders finished this month, but I don't want to put that much pressure on myself. There's too much other stuff going on these days. This is a closer look at the piecing. The whole thing has been paper pieced and then appliqued. I've lost count of the number of times while working on this that I've decided that the men in the white coats really need to come and take me away. One of the reasons I've been putting off finishing this was lack of someplace to put it. However, I measured the walls on my studio a couple of days ago, and discovered that it will fit on a wall in there, which gives me added incentive to get it finished.